Qu, L., Wang, Z., Qian, J., He, Z., and Yi, S. (2019). "Effect of combined aluminum-silicon synergistic impregnation and heat treatment on the thermal stability, chemical components, and morphology of wood," BioRes. 14(1), 349-362. Wood is flammable and consumes a lot of energy during processing. To improve this material, wood was pretreated via aluminum sulfate–sodium silicate synergistic impregnation combined with heat treatment. The wood before and after pretreatment was analyzed through the solids weight changes, thermogravimetric and differential thermogravimetric analyses, somke density, scanning electron microscopy, and Fourier-transform infrared spectroscopy. The experimental results showed that the combined treatment could reduce the energy consumption of the heat treatment by catalyzed thermal degradation with aluminum-silicon synergistic impregnation. This procedure improved the thermal stability of the wood. Meanwhile, the combined treatment resolved the problem of increased smoke release caused by the impregnation of aluminum sulfate–sodium silicate modification reagents. Wood is a natural and renewable lignocellulosic material characterized by a high strength-to-weight ratio, low energy cost for processing, good environmental sustainability (Cui et al. 2017; Wang et al. 2018), natural degradation, and being environmentally friendly (Schwartz et al. 2018). Wood has thus been extensively used in construction, buildings, and furniture (Okon et al. 2017; Hosseinpourpia et al. 2018) for many years. As a lignocellulosic material, wood mainly consists of hemicellulose, lignin, and cellulose (Nishimura et al. 2018), and it is combustible. Wood is also prone to hygroexpansion and anisotropy (Skaar 1988), i.e. has a low dimensional stability. These characteristics dramatically shorten the service life and value of wood products, thus limiting its wider applications. At present, to improve fire retardancy, wood can be chemically modified with the impregnation of flame retardants (Seo et al. 2018). Compounds containing boron, phosphorus, bromine, chlorine, nitrogen, or a combination of two or more of these elements have reportedly improved the thermal stability of wood (Lu et al. 2015; Park et al. 2015; Elvira-León et al. 2016; Jebrane et al. 2018). Slight improvements have been observed with these treatments because the synergistic effect of nitrogen, phosphorus, and boron promotes char formation (Lowden et al. 2013). However, increasing awareness of the environmental issues and consumer safety of flame retardants indicates that the use of conventional boron and formaldehyde may decline (Candan et al. 2013; Chen et al. 2018). A current challenging goal in the industry is the use of efficient and low toxic compounds as flame retardants to reduce the use of halogenated flame retardants (Zhao and Deng 2006). As one kind of inorganic flame retardant, silicon flame retardants have the advantages of a low heat release, low release of carbon monoxide (Hamdani et al. 2009), and environmentally friendly and multi-functional characteristics. Additionally, they can be impregnated into the pyrolyzed areas of the wood combustion layer. When wood is treated by inorganic silicon flame retardants, the smoke concentration during combustion is low, heat release is reduced, and flame spread is slow. Under a normal temperature and pressure, treatment of wood with sodium silicate not only improves the flame retardancy, but it also increases the degradation resistance of the wood (Pereyra and Giudice 2009; Canosa et al. 2011; Jiang et al. 2018). As silicon reagents are prone to evaporation and can be easily lost and because the strong alkaline conditions have an impact on the cellulose and lignin components, the sodium silicate modifier needs to be compounded with other reagents. Aluminum sulfate is attractive to researchers, as it has the advantages of an ultra-low toxicity, wide source, and low cost. Meanwhile, preferentially impregnating aluminum sulfate can neutralize the basicity of water glass (sodium silicate). An acidic environment can promote the thermal degradation of wood and accelerate the formation of a carbon layer when heated, which thereby reduces the time and temperature required for heat treatment and reduces the energy consumption (Zhou et al. 2000; Heng 2009; Qu et al. 2011). The precipitation product of aluminum sulfate and sodium silicate (mainly including aluminum hydroxide, aluminum silicate, and sodium sulfate) also has good thermal stability, which can protect the carbon layer (Furuno et al. 1993; Liang et al. 2013). However, the moisture absorption of wood modified by such composite inorganic agents increases, which affects its dimensional stability. Heat treatment, as an environmentally friendly approach, can improve some wood properties, such as by enhancing the hygroscopicity and dimensional stability, reducing the wettability (Gao et al. 2016; Hidayat et al. 2017), and increasing the durability (Li et al. 2015; Humar et al. 2016; Yang et al. 2018), thus improving the wood’s properties. However, heat treatment involves energy and time consumption because of the high temperatures used. In this study, wood was first impregnated with aluminum sulfate, followed by impregnation with sodium silicate. Subsequent heat treatment led to an improvement in the wood thermal stability and a decrease in the release of smoke. This study aims to lay the foundation for improving the flame retardancy of Paulownia and provide a promising modification reagent. Paulownia (Paulownia elongata) sapwood samples that were straight-grained, knot-free, and with no visible defects were provided by Guangxi Ushine Home Products Ltd (Guangxi, China). The dimensions of the samples were 20 mm × 20 mm × 20 mm and 25 mm × 25 mm × 20 mm, and all of the samples were dried at 80 °C to a constant weight. The final weight of each sample was recorded, and the samples were divided into Groups A, B, C, and D. Each group consisted of 20 samples. All of the chemical reagents used were purchased from Sinopharm Chemical Reagent Co. Ltd. (Shanghai, China). The wood samples in Group A were immersed in distilled water. The Group B samples were treated with 26.7% aluminum sulfate solution, and under the vacuum at 0.06 MPa. The vacuum was released for 30 s every 3 min, and this vacuum-release cycle was maintained for 30 min. Then, the Al2(SO4)3-treated samples were placed into a 30% sodium silicate solution for 12 h under atmospheric pressure. Meanwhile, the control group (Group A) samples remained immersed in distilled water under the same conditions. Groups C and D were pretreated under the same conditions as Groups A and B, respectively. After impregnation, all of the wood samples were dried at 80 °C to a constant weight. After all of the samples were dried, the mass of each was measured. After the samples were dried at 80 °C, only Groups C and D were placed in an oven at 180 °C for 4 h with steam protection to determine whether aluminum–silicon impregnation would affect the thermal stability of the samples. The specific conditions for each group are shown in Table 1.
where Wi is the dry weight (g) at 80 °C of the samples after aluminum sulfate–sodium silicate synergistic impregnation, and Wh is the weight (g) of the aluminum sulfate–sodium silicate impregnation treated samples after 180 °C heat treatment. The thermal properties of the untreated and treated Paulownia wood samples were measured using a Netzsch STA449F3 computerized thermobalance (NETZSCH Gerätebau GmbH, Munich, Germany). For this analysis, the samples were heated from 0 °C to 900 °C at a constant heating rate of 10 °C/min in a nitrogen atmosphere (100 mL/min). The smoke emission characteristics of the samples were measured according to (GB/T 8627-2007) by a smoke density test (JCY-2, Jiangning, Nanjing, China), for which each sample was cut into the dimensions of 25 mm × 25 mm × 6 mm. 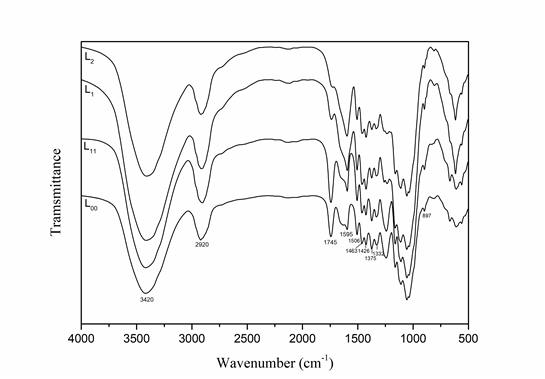 Fourier-transform infrared (FTIR) spectroscopy was used to examine the surface chemical compositions of the untreated Paulownia wood and the Paulownia wood that had undergone the impregnation treatment. The control group and impregnation-treated group were separately milled into 200-mesh-sized particles and then mixed with potassium bromide pellets at a ratio of 1:100 (by weight) for FTIR spectroscopy (Tensor 27, Bruker, Karlsruhe, Germany). The samples were then analyzed over a scanning range of 4000 cm-1 to 400 cm-1 at a resolution of 4 cm-1 with 32 scans. The samples that were dried to a constant weight were randomly selected from both the control and impregnation-treated groups and cut to the dimensions 5 mm × 5 mm × 2 mm. Each of the untreated and treated samples was fixed on conductive adhesives and coated with gold for the scanning electron microscopy (SEM) analysis (Hitachi S-3400N II, Tokyo, Japan). Notable WPGs were observed for the samples that underwent the aluminum sulfate–sodium silicate synergistic impregnation treatment. The WPGs of the impregnation-treated samples were higher by 33.8% relative to that of the control group, but WPLs is very small in impregnation-heat treated samples, only 5.6% relative to that of the impregnation treated samples. This result revealed that the aluminum sulfate was successfully impregnated into the wood samples. The reason for the increased WPGs may be due to the Al3+ ions, which could penetrate the inner layers of the fibrous cell walls through the nanometer voids in the fibers. Also, Al3+ ions can easily bridge with hydroxyl-containing substances, as wood contains a large number of hydroxyl groups and the silicic molecules produced by the hydrolysis of sodium silicate also contain hydroxyl groups (Benalycherif and Girault 2010; Irfan et al. 2013). During the impregnation process, a sodium silicate solution was added to form thicker aluminum-silicon compounds (mainly including aluminum hydroxide, sodium sulfate, aluminum silicate) by an adsorption bridging effect (Cai 2015). Subsequently, aluminum-silicon compounds were deposited in the wood (Gong et al. 2013). From a macroscopic view, the weight gain rate of the sample increased. Wood is mainly composed of cellulose, hemicellulose, lignin, and some extractives. Thermal degradation of wood can be regarded as the superposition of the three major pyrolysis processes. Figure 2 shows that the main reaction zone for the specimen without the impregnation treatment had a shoulder and an intense peak in the DTG curve. This was attributed to the different thermal degradation regions of the three wood components. Thermal degradation of hemicellulose occurs at a lower temperature, and mostly starts at less than 350 °C; thermal degradation of cellulose mainly occurs at 315 °C to 400 °C; and thermal degradation of lignin occurs between 250 °C and 900 °C (Liao et al. 2008). Therefore, the shoulder peak mainly corresponded to the thermal degradation of hemicellulose, whereas the main peak corresponded to the thermal degradation of cellulose. Meanwhile, no shoulder peak was observed in the impregnation-pretreated wood. This finding indicated that heat treatment after the impregnation pretreatment effectively degraded part of the hemicellulose in the wood, which can help to improve the wood performance. The selection of 180 °C as the treatment temperature was based on the consideration of the energy consumption problem and the influence of a high temperature on the wood color. 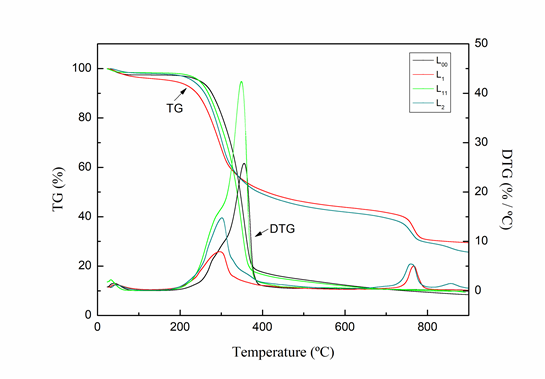 Compared with L00 (control group), the TG and DTG curves of L11 (aluminum-silicon impregnation/without heat treatment) moved slightly toward the low temperature region and the maximum heat loss rate was greatly increased. This result was attributed to the heat treatment of wood at 180 °C. During heat treatment, part of the hemicellulose might have decomposed into acids, and the acids that remained inside of the wood, where they accelerated further thermal degradation of the material. Moreover, the degradation of hemicellulose increased the internal space in the wood, thus facilitating pyrolysis (Chen et al. 2012). The results from the thermal analysis revealed that the onset and offset temperatures of the main reaction zone for L00 were almost identical to those of L1, and the peaks of the DTG curves for L1 shifted to a slightly lower temperature zone. This shift may have been because the precipitates produced during the impregnation process clogged voids in the wood and prevented further reactions. Hence only a small amount of aluminum sulfate remained in the wood, which promoted the thermal degradation of wood, produced a carbon layer, and had similar results to those of previous studies (Wang et al. 2017; Hosseinpourpia et al. 2018). However, the weight loss of L1 in the main reaction zone was smaller than that for L00. When the temperature was 380 °C, the weight loss in L00 was 81%, whereas in L1 it was only 52%, which was a decrease of 29%. Compared with the sharper DTG peaks of L00, L1 showed wide and flat DTG peaks. Moreover, the maximum mass loss rate in this reaction zone apparently decreased from 25.8% to 7.9%. This reduction could have been because of the precipitated product, which formed silicon compounds that contain Si-O-C and -Si-C- bonds during the thermal degradation process (Ogiso and Saka 1994). Silicon compounds can effectively protect the carbon layer and the high-temperature-resistant precipitated product can coat the wood powder to act as a physical barrier and also affect dilution. This occurrence led to a reduction in the thermal degradation and weight loss rates, as well as an increase in the thermal stability of the material. From 380 °C to 720 °C, only 11% of the weight of L1 was lost at a considerably low rate. These results indicated an improvement in the stability of the char residue. Figure 1 shows that in the 720 °C to 800 °C range, L1 had a secondary reaction region. The occurrence of this phenomenon may have been because of the high temperature, which caused precipitates to break down (Hu 2012; Gong et al. 2013; Liang et al. 2013; Zhao and Xu 2018). In the main reaction zone, the onset and offset temperatures for L2 and L11 were basically the same. Although the maximum weight loss rate of the L2 samples slightly shifted to the low-temperature zone, the maximum mass loss rate was considerably lower. When the temperature was 380 °C (offset temperature), the maximum mass loss rate of L11 was 42.68%/°C, whereas that of L2 was only 14.64%/°C, which was a difference of 28%/°C. This decrease was attributed to the previously described phenomenon. This result showed that the impregnation pretreatment effectively improved the thermal stability of the wood when heat-treated at high temperatures. The low smoke emission of the control group can be attributed to the flashover and rapid combustion of wood after ignition, which emits a large amount of light and heat, and the smoke is mainly produced during the smoldering phase. The smoke density of Group C was smaller than that of the control group, and it burned rapidly and burned sufficiently after ignition. As shown by the results of the thermogravimetric analysis, its thermal stability decreased compared to the control group. It may be that during the heat treatment, part of the volatile extractives was volatilized and a small amount of components were decomposed. Consequently, the voids in the wood increased and the contact area of oxygen and wood components increased. Observing Group B, it can be seen that the amount of smoke increased significantly after the aluminum sulfate–sodium silicate synergistic impregnation treatment. This can be explained by the mechanism of precipitation products filling the voids of the wood, resulting in an increase in density, which made it very difficult for oxygen to penetrate the interior of the wood. The excessively incomplete combustion of the wood caused an increase in the amount of smoke, and the smoldering phase was significantly prolonged. But too much smoke is harmful to people’s efforts to escape in the event of a fire. Compared with Group C, Group D had a longer smoldering stage, but it produced less smoke. This was due to the heat treatment at 180 °C which caused the surface of the samples to be charred, resulting in a reduction in the combustible components of the wood surface and isolating the wood components from further contact of the oxygen. Meanwhile, MDR of all samples was obviously less than 75, which is in line with the standard (GB/T 8267-2007). Fourier-transform infrared spectroscopy is a nondestructive and reliable method for studying the chemical constituents of lignocellulosic materials. The FTIR spectra of the samples are shown in Fig. 3. The peaks observed at 3420 cm-1 and 2920 cm-1 indicated that the stretching vibrations of O–H and C–H increased with the impregnation pretreatment (Sain and Panthapulakkal 2006; Ling et al. 2015; Guo et al. 2016). These changes revealed an increase in the hydroxyl group content. Moreover, the C–H groups interacted strongly with water molecules via hydrogen bonding. The increase in this peak indicated that the single impregnation treatment can affect the hydrophobicity of wood (Pouzet et al. 2017). The prominent peak at 1745 cm-1 in the Paulownia wood was attributed to hemicellulosic acetyl and uronic ester groups or to the ester linkage of carboxylic groups of the ferulic and p-coumaric acids of lignin and/or hemicellulose (Himmelsbach et al. 2002; Lionetto et al. 2012; Koutsianitis et al. 2015). As was observed after the impregnation treatment, this peak caused by O–H stretching was considerably reduced. Lignin peaks were at 1595 cm-1 and 1506 cm-1 for C=C stretching of the aromatic ring, and at 1463 cm-1 for CH3 bending. Typical bands assigned to cellulose were located at 1426 cm-1 and 1375 cm-1 for CH2 and CH bending, respectively, and at 1332 cm-1 and 897 cm-1 for hydroxyl bending, which also represented the state of the cellulose in the treated material (Temiz et al. 2010; Fackler et al. 2011). Unlike the peaks representing hemicelluloses, the variation in several peak intensities representing lignin and cellulosic components were small. The reason for this may be that the material was pre-soaked in an acidic aluminum sulfate solution. Thus, under the conditions of a low temperature and acid catalysis, part of the hemicellulose was hydrolyzed. However, the solid structure of the cellulose impeded decomposition at room temperature. Consequently, the impregnation treatment only slightly affected cellulose. This finding also showed that the use of the impregnation treatment increased the hygroscopicity of the material. Thus, it was concluded that this technique should be combined with other methods for further material processing to reduce the hygroscopicity and improve the dimensional stability. By comparing the samples in groups L1 and L2, it was found that after the heat treatment, the free hydroxyl group content of the samples pretreated with the aluminum-silicon synergistic impregnation treatment declined substantially. This result suggested that the high-temperature heat treatment is an effective and environmentally friendly method for reducing the free hydroxyl groups resulting from the impregnation treatment. Moreover, given that both L1 and L2 groups underwent the aluminum-silicon impregnation treatment, the peak intensity at 1745 cm-1 was small, although it was smaller for L2. This difference indicated that high-temperature heat treatment could further aggravate the degradation of hemicellulose. The peaks representing cellulose and lignin changes were still small, which enhanced the wood hydrophobicity. Furthermore, the aluminum-silicon synergistic impregnation treatment combined with heat treatment at 180 °C only slightly affected the cellulose and lignin components, which had a considerable effect on the wood strength. Figure 4 shows the SEM images of the samples before and after the impregnation treatment with aluminum-silicon. The SEM images of the control group and group pretreated with aluminum-silicon impregnation and without a high-temperature heat treatment are presented above. Compared with that of the control group, the aluminum sulfate was mainly concentrated in the vessel lumen of the Paulownia wood and the distribution was uniform. Some precipitation was observed in the axial parenchyma, but it was lower than the content in the vessel. The influencing mechanism of the combined aluminum-silicon impregnation and heat treatment on the Paulownia wood is described in Fig. 5. The wood cell wall is mainly composed of cellulose, hemicellulose, and lignin. During the impregnation process, the aluminum sulfate was preferentially impregnated. The Al3+ ions entered the interior of the wood through wood pits and other water passages, while some Al3+ ions entered into the cell walls via chemical bonding. The subsequently impregnated sodium silicate combined with the aluminum sulfate through the adsorption bridging reaction and produced a high-temperature-resistant precipitation product that was uniformly distributed inside of the wood. However, the hygroscopicity of the wood after impregnation was increased. During the preheating process (80 °C), part of the hemicelluloses in the impregnation-treated group underwent thermal degradation at a low temperature and acidic conditions, which generated a small amount of acid residues in the wood. Therefore, during heat treatment at 180 °C, the wood rapidly formed char layers on the surface during catalysis of the trace acid. This insulated the internal material from further contact with oxygen. At the same time, the precipitate effectively protected the carbon layer and trapped the wood. Therefore, this combined treatment not only improved the wood thermal stability, but it also reduced the moisture absorption. The effect of aluminum-silicon synergistic impregnation had a noticeable effect when the wood was first impregnated with aluminum sulfate and then immersed in the sodium silicate solution. The wood weight gain rate reached 33.8%. The aluminum-silicon synergistic flame retardant system effectively improved the thermal stability of the wood. After the aluminum-silicon synergistic impregnation treatment, the thermal degradation temperature moved slightly to a low-temperature region, but the thermal degradation rate decreased remarkably. The impregnation treatment by itself can prolong the smoldering phase of the wood, but the amount of the smoke increased. However, the amount of smoke was reduced in the case of the aluminum-silicon impregnation treated sample that also had been heat treated. This indicates that the impregnation-heat treatment method can effectively reduce the amount of smoke under the guarantee of better thermal stability. This study was financially supported by the Major Scientific and Technological Achievements Incubation Projects in Beijing Forestry University (2017CGP014), the Fundamental Research Funds for the Central Universities of China (2015ZCQ-CL-01), and the Hot Tracking Project in Beijing Forestry University (2017BLRD04). Cai, L. (2015). Preparation and Fire Retardant Mechanism of Recycled Paper Foaming Material with Silicon-alumium Compounds, Master’s Thesis, Fujian Agriculture and Forestry University, Fuzhou, China. Chen, L., Xie, G., Ma, H., He, X., and Zhang, Y. (2012). “Study on the influence of accelerated heat-treatment on wood color changes,” Guangdong Forestry Science and Technology. Gong, M., Cheng, R., Song, Y., Zhou, H. (2013). “Methods of Inorganic Modification of Wood,” Forest Engineering. Heng, L. (2009). Study on Modifying Populus Wood by Silicates, Master’s Thesis, Northeast Forestry University, Harbin, China. Hu, F. (2012). Preliminary Research on the Flame Retardant Effect and Mechanism of the Preparation for Paper which Coating by Compounded with Hydroxide System of Sodium Aluminum Silicate, Master’s Thesis, Guangxi University, Nanning, China. 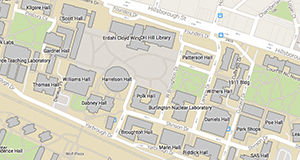 Liao, Y.-F., Ma, X.-Q., and Sun, Y.-M. (2008). “Kinetics of pyrolysis and metal-salt catalized pyrolysis of wood,” Chemistry and Industry of Forest Products 28, 45-50. Liang, Y. S., Jian-Ying, Y. U., Wen-Zu, L. I., and Yao, T. T. (2013). “Preparation and properties of flame-retardant bitumen with aluminium trihydroxide/montmorillonite,” Journal of Wuhan University of Technology. Ogiso, K., and Saka, S. (1994). “Wood-inorganic composites prepared by Sol-Gel process, 4: Effects of chemical bonds between wood and inorganic substances on property enhancement,” J. Jpn. Wood Res. Soc. 40(10), 1100-1106. Park, H.-J., Wen, M.-Y., Cheon, S.-H., Kang, C.-W., and Matsumura, J. (2015). “Fire retardant performance and thermal degradation of Korean pine treated with fire retardant chemical,” Faculty of Agriculture Kyushu University 60(1), 183-189. Skaar, C. (1988). Wood-water Relations, Springer-Verlag, Berlin, Germany. Zhao, Q., and Deng, G.-l. (2006). “The application of flame retardant in paper industry,” China Pulp and Paper Industry. Article submitted: August 17, 2018; Peer review completed: November 7, 2018; Revised version received: November 14, 2018; Accepted: November 15, 2018; Published: November 20, 2018.